We all know why, more or less, former Ford CEO Mark Fields was abruptly let go last week: Ford’s stock price is way down as it, and other automakers, have a hard time convincing Wall Street they’re prepared for the future. And the board isn’t happy. But there’s more to that situation, Sharon Carty over at Automotive News reports in a must-read story. Fields knew a big tech partnership with a Silicon Valley firm would make a huge splash and give him the investor confidence Ford needed. That’s why he tried to make a deal with Google to develop autonomous vehicles at the end of 2015, before any of the major automakers had a solid plan to make autonomous vehicles work. At the time, Google was also still looking for a car platform—preferably hybrid and/or electric—to build their autonomous technology on. A look back at the timeline of the Ford-Google talks reveals a moment that became a turning point in Fields’ career at Ford. 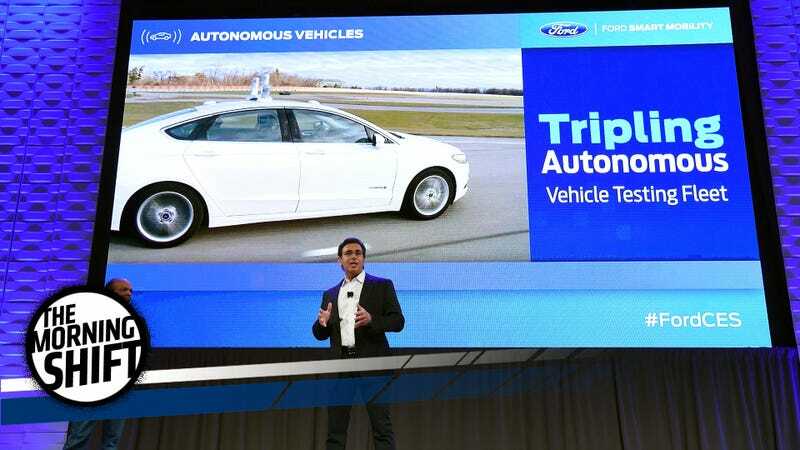 His failure to pull off the deal indirectly left Ford struggling to voice an autonomous vehicle strategy that resonated with stakeholders and led to the emergence of Jim Hackett as his replacement as CEO. Google was comfortable with the Silicon Valley approach of “frenemies” — sometimes partnering with competitors so each side can learn something. That concept seemed anathema to Ford, sources said. Overall, one of these partners was way into this budding relationship than the other. Google wanted more of a quiet technical partnership whereas Fields and Ford wanted to do something big enough to bump that lagging stock price. News of a possible partnership still leaked out to the press, which bumped Ford’s stock but caused a dip in Google’s. When an expected announcement about a Ford-Google tie-up didn’t happen at the Consumer Electronics Show in 2015, no one was happy. Within weeks of the deal falling apart, Executive Chairman Bill Ford identified [Jim] Hackett, a member of Ford’s board, as someone who had a good relationship with Silicon Valley. Hackett was named head of the new Ford Smart Mobility unit just a few weeks after that and was named CEO a little more than a year later. You can read the whole unusual tale here. First Dieselgate, now BMW—the troubles for embattled automotive supplier giant Bosch just don’t seem to end. A lack of steering gears supplied by Bosch, the world’s largest car parts supplier, means there’s only limited vehicle production at various German plants, while factories in Tiexi, China, and Rosslyn, South Africa, have moved up or extended planned interruptions, BMW purchasing chief Markus Duesmann said Monday in an emailed statement. Bosch said it’s working intensively with BMW to minimize the impact. The disruption was caused by a bottleneck at an Italian company that supplies the casings for Bosch’s electronic-steering systems, the Stuttgart, Germany-based firm said in an emailed statement. It dispatched employees to Italy to help solve the problem as soon as possible. BMW is still recovering from a rough first quarter where their profitability dropped in the midst of overhauling several models at once and investment in new technology at the company. The steering gear shortage interrupted production of many of BMW’s bread-and-butter smaller cars, including the 1-series, 2-series, 3-series and 4-series. While BMW can make up some for lost time by adding shifts, it’s unclear how much the parts shortage has cost them just yet. Either way, they’re blaming Bosch for it and want Bosch to pay up. ﻿“We view all legal claims against Porsche SE related to the diesel issue as unfounded,” CEO Hans Dieter Poetsch, who is also VW supervisory board chairman, said Tuesday in a prepared speech at Porsche’s annual shareholders’ meeting in Stuttgart, Germany. Porsche is “convinced” that none of its board members violated stock market rules, he said. Legal woes intensified after Stuttgart prosecutors confirmed this month they’re investigating Poetsch, along with VW CEO Matthias Mueller who also sits on Porsche’s management board, and Martin Winterkorn, a former CEO of both companies. Authorities allege the men waited too long to inform shareholders of Volkswagen’s emissions cheating problem after it hit the fan in September 2015, which would be considered market manipulation. Similar allegations are also being made about Volkswagen stock. Volkswagen ultimately admitted that 11 million of its diesel vehicles were cheating on emissions tests. The entire Dieselgate debacle has cost them $25.1 billion to date—and counting. In recent years, Gentex closed its two foreign plants in low-wage Mexico and China and consolidated all production into a single factory complex in western Michigan. ﻿But Gentex designed its plan not for political reasons, but for purely competitive ones as its products become more complex. And for champions of the push to create U.S. automotive jobs, Gentex has sobering news: Making modern car parts in America today is going to take a whole lot of robots. Factory automation is what made it possible for Gentex to move production from overseas to the Midwest. Robots are cheaper to keep around than people, and for Gentex, they’re also driving their defect rate down. It’s dramatically affected the size of their workforce as well, with mirror production lines formerly staffed by 20 to 30 workers now only staffed by 5 or 6. In 2017, compact and subcompact car sales are down 25%. But hatchbacks in those classes have risen 16%. A rush of new models will test the strength of that demand. And rightfully so: the hatchback version of many new small cars looks so much better than the version with a trunk. They’re also shorter than the sedans, but often offer more space in the rear thanks to the extra height. Hatchbacks now account for a quarter of all small car sales. Ford in particular is enjoying the hatchback bump, with 40 percent of Fiesta and Focus sales coming sans trunk. Neutral: Are You A Hatch Fan? Would you ever give up the easily enclosed confines of a trunk for hatchback life? Or have you already?